﻿﻿﻿Hope your day is going well. I haven’t done much post processing so I’m scrapping the bottom of the barrel here. This one was taken recently on one of my morning walks with Rose and Mimi (the pom). (It’s getting less and less frequent for me but that’s another story.) I couldn’t think of anything fancy or witty to say about this image. No existential reflection. No deep rumination. It’s a picture of leaves with droplets from the morning sprinklers. What else can be deep about it? 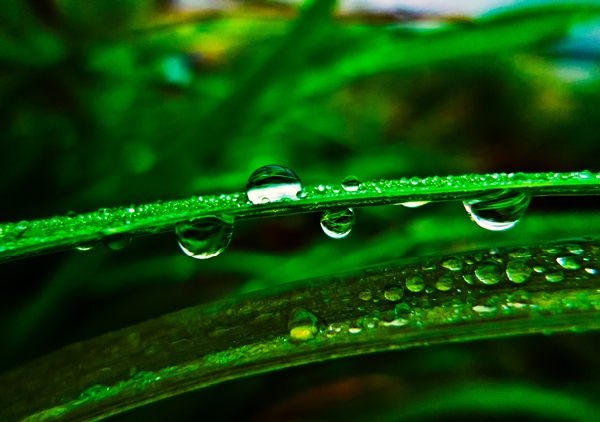 I set out to take pictures of droplets on leaves that day. This one came out the strongest. I used my beat up Point and Shoot because it was crying out to be used. My other cameras don’t complain much because they get their regular exercise. Although there is nothing really special about this image, I’m pretty satisfied with it considering the kind of camera I used. With P&S, it’s not easy to get the background blurry even at wide aperture. Perhaps, it was the challenge that gave me satisfaction. Looking at it, it does yearn to be seen. Just like my P&S, it yearns to catch moments in time.